Dan Budnik (1933) persuaded Life to have him create a long-term photo essay documenting the Selma to Montgomery march. His photographs are now in the collection of the Martin Luther King, Jr. National Historic Site. Bruce Davidson (1933) chronicled the events and effects of Civil Rights Movement, in both the North and the South, from 1961 to 1965. In support of his project, Davidson received a Guggenheim Fellowship in 1962 and his finished project was displayed at the Museum of Modern Art in New York. Upon the completion of his documentation of the Civil Rights Movement, Davidson received the first ever photography grant from the National Endowment for the Arts. Bob Fitch was the Southern Christian Leadership Conference (SCLC) photographer in 1965 and 1966. 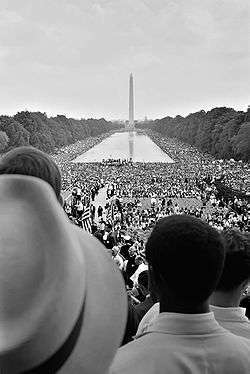 His images includes school integration, voter registration actions, and candidate campaigns in Alabama, Mississippi and Georgia; the Mississippi James Meredith March Against Fear; and intimate photos of the King family during Dr. King's funeral. His pictures appeared nationally in Afro-American publications including Johnson Publishing's JET and EBONY. Fitch's photos appeared in the 1997 Smithsonian Exhibit "We Shall Overcome", and his portrait of Martin Luther King, Jr. in his Atlanta, Georgia, office with a print of Mohandas Gandhi on the wall, is the model for the Martin Luther King, Jr. Memorial monument in Washington D.C.
Charles Moore (1931-2010), photographed a 1958 argument between Martin Luther King, Jr. and two policemen. His photographs were distributed nationally by the Associated Press, and published in Life, and he began traveling throughout the South documenting the Civil Rights Movement. Moore's most famous photograph, Birmingham, depicts demonstrators being attacked by firemen wielding high-pressure hoses. U.S. Senator Jacob Javits said that Moore's pictures "helped to spur passage of the Civil Rights Act of 1964." Gordon Parks (1912-2006) was assigned by Life in 1963 to travel with Malcolm X and document the Civil Rights Movement. He was also involved with the movement on a personal level. In 1947, Gordon Parks documented Dr. Kenneth Clark's infamous Doll Test. It is those pictures, published in Ebony in July 1947, that were used as evidence in the Brown v. Board of Education trial and helped sway the ruling. Herbert Eugene Randall, Jr. (1936) photographed the effects of the Civil Rights Movement in Hattiesburg, Mississippi in 1964, at the request of Sanford R. Leigh, the Director of Mississippi Freedom Summer's Hattiesburg project. Randall spent the entire summer photographing solely in Hattiesburg, among the African-American community and the volunteers in area projects such as the Freedom Schools, Voter Registration, and the Mississippi Freedom Democratic Party campaign. Five of Randall's photographs were published in the summer of 1964, and one seen worldwide was the bloodied, concussed Rabbi Arthur Lelyveld, head of a prominent Cleveland congregation and former conscientious objector to World War II. In 1999 Randall donated 1,800 negatives to the archives of The University of Southern Mississippi in Hattiesburg. He and Bobs Tusa, the archivist at USM, wrote Faces of Freedom Summer, which was published by the University of Alabama Press in 2001. Faces is the only record of a single town in the midst of America's Civil Rights movement. Art Shay (1922) photographed the Chicago Freedom Movement. Working freelance for Life, the Saturday Evening Post, Time and other magazines, Shay started covering integration issues in 1953. In 1959 he covered the Deerfield Housing Crisis, in 1961 block busting, then the 1963 Freedom March, school boycotts, and Martin Luther King's 1966 Chicago Freedom Movement rally at Soldiers Field. Shay also covered the 1966 Chicago and the 1967 Detroit riots. Moneta Sleet Jr. (1926-1996) won the 1969 Pulitzer Prize for Feature Photography for his photograph of Martin Luther King, Jr.'s widow, Coretta Scott King, at Dr. King's funeral. Sleet is the first African American man to win the Pulitzer, and the first African American to win award for journalism. Cecil J. Williams began photographing the origin of the Civil Rights Movement in Clarendon County, and Orangeburg, South Carolina; and at eleven years old, beginning with Thurgood Marshall, arriving by train in Charleston, South Carolina to argue the Briggs v. Elliott case. His collection of nearly one million film images is perhaps one of the largest in the world. At fourteen years old, he became a freelancer for "JET." Later, he regularly contributed to the "Afro-American," "Pittsburgh Courier," and other weekly publications. Some of the notable events he photographed include: the Briggs v. Elliott petitioners, Elloree School Teachers, Minister Billy Graham's 1957 New York Crusade at Madison Square Garden, Harvey Gantt being admitted to Clemson University, John F. Kennedy's presidential announcement, the Orangeburg Massacre, and the Charleston Hospital Workers Strike. His photograph of Coretta Scott King involved in the Charleston Hospital Workers Strike was featured on the front cover of JET. Other photographs he made appeared in "Newsweek," "TIME," and the Associated Press. He was twice arrested and jailed for photographing student demonstrations. In 2015, he invented the FilmToaster, a fast camera scanning instrument, to scan his mammoth film collection. Many of his iconic images from the era of civil rights have appeared on front covers of numerous historical publications. ↑ Loke, Margarett (2002-04-05). "James Karales, Photographer of Social Upheaval, Dies at 71". The New York Times. ↑ "Selma to Montgomery: A March for the Right to Vote". The Spider Martin Civil Rights Collection. Retrieved 2006-01-04. ↑ "About Charles Moore". Kodak. Retrieved 2006-12-26. ↑ "We Shall Overcome: Photographs from the American Civil Rights Era". LBJ Library and Museum. Retrieved 2007-03-01. ↑ Fraser, C. Gerald (19 October 1986). "The Vision of Moneta Sleet in Show". The New York Times. Retrieved 2006-12-22.